Colleges and universities have not always been known for innovation in AV technologies, but advances in digital signage are putting higher education at the forefront of the field. Let me begin with a bit of candor. Over the years, I have observed that when those in the AV integration industry speak about typical projects for the education market, they usually sound mundane and it is easy to assume what the project will entail. Since the turn of the century, most AV designs have embraced a standard cookie cutter approach, with simply a projector (with a screen) or a flat panel display setup in the classroom. For the more advanced designs, perhaps a sound system and remote control of some sort. Until recently, the status quo meant that little creativity was inspired in education AV, and certainly few instances of pushing the technological envelope. For those out there who have more advanced systems, save the e-mails: I do know there are some examples of creativity and pushing the envelope, but most classrooms are just basic AV at the core. Rarely less, but rarely more. There are a lot of reasons for this. First and foremost, there are budgets to consider. Education has always been budget conscious with variations in funding region by region, school by school and department by department. The largest portion of funding tends to go to the most visible (read: profitable) departments and the more obscure ones tend to languish money-wise. A second issue is a lagging knowledge and acceptance of more advanced AV technologies in many schools. Again, this varies by department, but university technicians (a.k.a. the people who make the systems work) tell me that many professors are reluctant to learn how to use the systems, and have concerns that the systems are unreliable and will impede their teaching effectiveness. The fact is that whether we are speaking about budgets, total cost of ownership or learning curves (and acceptance) by the teaching community, education has not been a bastion of AV technological advancement until recently. Of course this begs the question, what has changed? 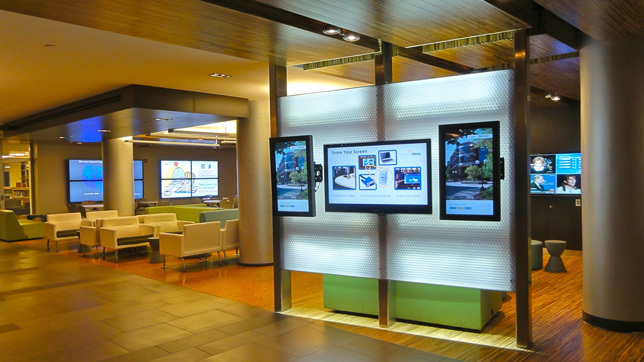 The answer lies within two concepts: the ubiquity of networks and digital signage. These two elements have altered the way things are done on many university campuses, and the combination involves a rapid expansion far beyond the confines of a projector or flat panel display in the student union that might have been a typical example a few short years ago. Conventional wisdom tells us that educational institutions should be a driving force of innovative ideas and applications, but the hallowed halls of academia have not always lived up to that ideal — at least in the case of AV technologies and advanced communications. The good news is that colleges and universities are now beginning to exceed previous expectations. In fact, the world of education is becoming the incubator of AV technologies and digital signage applications, design and acceptance in the market. Advances in digital signage are permeating other market niches as well, such as corporate and healthcare, with education rightfully leading the way. Bold claims aside, let's examine some specifics on how this has become a reality. As an umbrella to all of this, we need to consider the impact that instant information and connectivity have had on all our lives, and how it has radically changed how we think and act over the last few years. As a population, we have changed the way we send and receive information in every way — from our TV viewing habits at home, all the way to business and yes, education. We are not only acclimated but in many cases addicted to our smartphones, tablets, laptops and even smartwatches with e-mails, text messages and tweets. We don't write personal letters anymore, we communicate via Facebook or Twitter and connect professionally via LinkedIn. People are expecting and demanding that information come to them immediately where they are and not vice versa. This is the genesis of the new wave and expanded view of communication and uses of digital signage. Why are the education community, colleges and universities leading the way? It comes down to the concept of necessity being the mother of invention, with some innovation thrown in. First, consider the university in a new light: By its very design it is a full-fledged, encapsulated and controlled community (for the most part), with most services that the outside world utilizes collected in one spot. It is an ecosystem unto itself. It is an ideal lab to be used as a test bed for expanded communication using digital signage. There are classrooms spread about, administration buildings, student unions, cafeterias, dorms, athletic facilities, stadiums, healthcare, maintenance facilities, public areas, roads and signs, and even power plants. The common denominator in all this diversity is the need to connect these disparate areas to one another in some manner and do so with the ability to centrally manage the flow of information with a high degree of security. The perfect solution to this is digital signage. There are numerous examples of digital signage areas where the educational community has been at the forefront for some time. Take the emergency notification networks that are mandated by nearly every state, for instance. There must be a way to get emergency warnings throughout the campus. This must be managed in a central location, but with the ability to access it at other predetermined spots (with proper security and administrative approval levels). Another example is wayfinding: Think about how complex many campuses are, with all the facilities we mentioned earlier that need to be included as part of finding a path to a location, room or a service in a building. Things like interactivity, accessibility and ADA compliance also need to be considered, as does the security of the interactive display itself against theft and vandalism. Environmental concerns are also part of the equation on most campuses, from outdoor to indoor with temperature extremes both cold and hot, as well as dirt and debris that might affect the operation of the network, and addressing the impact of high ambient light and the ability to read a display. We can wrap up the hardware side of this by mentioning two recent applications of digital signage. As we all know, the financial well being of educational institutions is critical, and most depend upon donors to make charitable contributions to fund projects of all types. The inclusion of what is known as "honor walls" is a trend at many campuses. This grouping of displays gives credit to those who step up to donate or provide leadership in other significant ways. When one department gets theirs, it is only a matter of time for the next one to demand time in the limelight for their VIPs. The second and most significant wave of technology adoption is the inclusion of portable devices connected wirelessly to the digital signage networks on campus. Whether it is near field communications (NFC) or some other wireless form of connectivity such as beacons, students, administrators, faculty and visitors can get information on their personal devices instantaneously no matter where they are. On the software side of things, the education community is now leading as well. Once again it is the diversity of applications within higher education institutions that stretches the envelope. From the ability to segment by applications, departments, locations or even functions, all the way to dayparting information in an area, it is the ability to control, distribute and manage information that is making innovation a reality. Add to this central management the ability to set administrative approval levels for the appropriate people to be in control, and you have a network capability that is profound in what it can do. Most of what we have spoken about involves a combination of hardware, operational software and networks. This is the raw material of the next phase of technological evolution in education. What's next you might ask? Our crystal ball tells us that the next phase is using the tools that exist to their best advantage to create what some are calling smart schools. We will see an expansion of the use of personal devices like smartphones and tablets connected to educational networks. Interactivity will become commonplace, with real-time annotations on screens. Online learning will supplement what takes place in the "confines" of a traditional classroom. We are entering the era of big data and increased and expanding access to the collective knowledge of the world, and a keyword is collaboration. Colleges and universities are leading the way in digital signage for a basic reason: More than most other institutions they have a wide range of applications under one environmental envelope with the requirement to communicate with people both on and off campus, and do so in real time with the best security that can be brought to bear. The challenge is how to solve the problems of reaching people with such diversity of needs for information and content, and manage it all effectively and efficiently. The education communities' answer to these needs ends up incorporating digital signage in more diverse ways, spanning the classroom to the campus and beyond. Perhaps some of this experimentation and development in digital signage is an unintended consequence, but we can look to colleges and universities to continue to lead the way in communicating the information viewers need as they go about their daily lives. Evolution? Nope, revolution in education where it should be.